One of Locke's opponents both on coinage and on interest was the prominent builder, fire-insurance magnate and land-bank projector, Nicholas Barbon (1637–98). Barbon, son of the fanatic London Anabaptist preacher and leather merchant and MP Praisegod Barbon, studied medicine and became an MD in Holland, moving to London and going into business in the early 1660s. In the same year as Child's Discourse About Trade, Barbon, who had just been elected to Parliament, published the similarly titled Discourse of Trade (1690), again timed to push for the 4 percent interest bill in Parliament. An inveterate debtor and projector, Barbon of course would have liked to push down his interest costs. In 1696, Barbon returned to the lists in a bitter attack on Locke's Further Considerations on the coinage. Arguing against Locke's market commodity, or "metallist," view of money, Barbon, urging devaluation of silver, countered with the nominalist and statist view that money is not the market commodity but whatever government says it is. Wrote Barbon: "Money is the instrument and measure of commerce and not silver. It is the instrument of commerce from the authority of that government where it is coined." Barbon and Locke set the trend for two contrasting strands in 18th-century monetary thought: Locke, the Protestant Scholastic, was essentially in the hard-money, metallist, anti-inflationist tradition of the Scholastics; Barbon, on the other hand, helped set the tone for the inflationist schemers and projectors of the next century. Murray N. Rothbard (1926–1995) was dean of the Austrian School. He was an economist, economic historian, and libertarian political philosopher. See Murray N. Rothbard's article archives. Comment on the blog. This article is excerpted from An Austrian Perspective on the History of Economic Thought, vol. 1, Economic Thought Before Adam Smith. An MP3 audio file of this article, read by Jeff Riggenbach, is available for download..
 Actually, Praisegod's real Christian name was highly unwieldy, even if more pious. He was named "Unless-Jesus-Christ-Had-Died-For-Thee-Thou-Hadst-Been-Damned" Barbon. In Barbon's A Discourse Concerning Coining the New Money Lighter, In Answer to Mr. Lock's Considerations… (1696). See Letwin, William Letwin, The Origins of Scientific Economics (Garden City, NY: Doubleday, 1965), note 2, pp. 78–9. Despite the hostility to Locke's point of view among modern inflationist and Keynesian historians, it is clear from Letwin's account, ibid., note 2, pp. 69–77, 260–70, that the calamitous price contraction that inflationists would have expected from the monetary contraction of the Lockean recoinage did not take place. 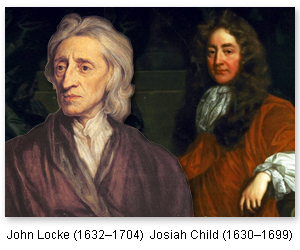 On Locke's clearly Scholastic-influenced view of the just price as the market price, as expressed in his book Venditio (1695), see Karen I. Vaughn, John Locke: Economist and Social Scientist (Chicago: University of Chicago Press, 1980), pp. 123–31. © 2010 Copyright Murray N. Rothbard - All Rights Reserved Disclaimer: The above is a matter of opinion provided for general information purposes only and is not intended as investment advice. Information and analysis above are derived from sources and utilising methods believed to be reliable, but we cannot accept responsibility for any losses you may incur as a result of this analysis. Individuals should consult with their personal financial advisors.